Scientists have been attempting to find a way to directly observe the developmental process of chicks for decades. The elegant process of developing from a single fertilized cell into a cluster of heart cells, and eventually into a tiny peeping chick is fascinating, but the eggshell has kept this process hidden from view. Eggshells are highly specialized structures that are hard to replace – they contain calcium, let oxygen in, and provide structure to the developing bird. If a bird’s eggshell cracks (either on accident like in nature, or on purpose because a scientist wants to deliver a drug to the developing bird), the only way to save the bird would be to very carefully replace the eggshell. One popular method of eggshell replacement involves using a surrogate eggshell from a bird that lays large eggs, such as the turkey. However, this method requires specialized equipment and access to turkey eggshells and has less than a 50% success rate. Another method involves cutting a small window out of the eggshell to directly deliver drugs to developing chicks and allow scientists to directly observe growth and development. However, this small intervention dramatically decreases the hatching rate of live chicks. Yutaka Tahara, a high school biology teacher in Japan, has spent 30 years addressing this issue of how to create a better method for researchers and students to observe the developmental process of chicks. After receiving a grant from the Japan Society for the Promotion of Science, he teamed up with a colleague at the Takanedai Animal Clinic and launched a structured investigation to find the best conditions for developing chicks. High school classes at four different schools are credited with helping to develop the amazing new method that resulted. The new method was published in the Japan Poultry Science Association’s Journal of Poultry Science. Their new method uses plastic wrap (just like you use in the kitchen) as a replacement for the eggshell. This material makes the process much cheaper and more accessible to scientists and high school biology classes – instead of finding a turkey eggshell to serve as a substitute, they can just pick up a roll of plastic wrap! They also use eggs bought from a grocery store, which are then fertilized manually in the lab and transferred to the new plastic wrap system. The transfer process is done very carefully so as not to introduce any harmful bacteria into the egg. The careful process of finding the best conditions for chicks to hatch allowed them to discover several things necessary for proper development of chicks. First, without the eggshell present to provide calcium for the developing chick, adding in a calcium supplement became very important. However, adding calcium too soon actually harmed the developing egg. Additionally, calcium had to be added in a powder form so that it was delivered at the correct developmental stage and in the correct amount. 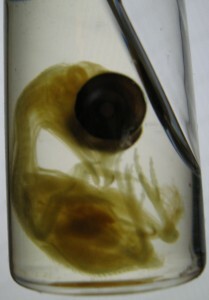 How the embryo controls this process inside the native eggshell is still unknown. After all their hard work, the students could watch the chick develop through the clear plastic wrap: first, the heart forms and begins to beat. 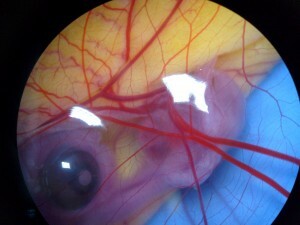 Then, the eye and beak develop and the embryo begins to look like a baby chick. Finally, after 20 days, the chick is fully developed and “hatches” from the egg, fully formed! See for yourself with the viral Youtube video. Besides being a great way to teach high school students about the developmental process of animals, this new method for growing chicks without an eggshell has some important implications. This method could be adapted to help endangered bird species whose eggs have cracked, therefore increasing the number of offspring that survive and can be relocated back into the wild. Scientists are also very interested in using this method to create genetically modified birds, as this method allows for constant monitoring of the developmental process after fertilization. Can you believe that such an important discovery came from a high school teacher and the experiments performed by students? Anyone with a good question can be a scientist and make a huge impact on the world – all you need is the scientific method and a testable hypothesis!